Amcor Flexibles is a market leader in responsible global packaging solutions for the food, beverage, healthcare, home and personal care industries. Cooltherm has worked with Amcor Flexibles for more than 25 years, installing and servicing 3 very large chillers at the company’s manufacturing facility on the outskirts of Bristol. In its most recent project, Cooltherm worked closely with Amcor Flexibles to replace one of the existing water cooled chillers at the site, after it had reached the end of its operational life and become uneconomical to repair. The new energy efficient turbomiser chiller, which is the biggest water cooled chiller in Cooltherm’s portfolio to date will run in tandem (on a sequencer) with the previously installed chiller from 2011, providing the best possible energy efficiencies and maximising cost savings. The sequencer has been installed to enable the new and existing chillers to communicate with each other and run as one chiller, or in any configuration required by Amcor Flexibles. 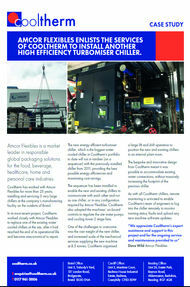 Cooltherm also adapted the machines’ on-board controls to regulate the site water pumps and cooling tower 2 stage fans. One of the challenges to overcome was the vast weight of the new chiller, and increased scale of the mechanical services supplying the new machine at 8.5 tonnes. Cooltherm organised a large lift and shift operation to position the new and existing chillers in an internal plant room. The bespoke and innovative design from Cooltherm meant it was possible to accommodate existing water connections, without massively increasing the footprint of the previous chiller. As with all Cooltherm chillers, remote monitoring is activated to enable Cooltherm’s team of engineers to log into the chiller remotely to monitor running status, faults and upload any new machine software updates.